Conveniently located a short distance from the capital Puerto del Rosario, and the resort of Caleta de Fuste, Fuerteventura's El Matorral Airport (FUE) is beautifully situated right by the ocean. A major Canary Island hub and main access point to the island of Fuerteventura, FUE Airport has convenient links to many cities in the UK, Ireland and the EU, as well as plenty of inter-island flights. Now the 10th busiest airport in the whole of Spain, Fuerteventura Airport serves well over four million passengers annually and up to 3,000 passengers per hour at busy times. El Matorral is located just 6 km / 4 miles south of Puerto del Rosario, the island's capital. The island's main route, the FV-1, has an exit that leads directly to the airport on the FV-2, facilitating fast and comfortable access between the airport and other destinations on the island. Puerto del Rosario and the resort of Caleta de Fuste are just a few minutes away by car, along with the Fuerteventura Golf Club, the Costa de Antigua and Llano del Sol. There is a wide range of ground transportation on offer, with plenty of local buses, commercial shuttles and taxi cabs, travelling to resorts such as Costa Calma, El Cotillo, Las Playitas and Tarajalejo. However, many visitors to Fuerteventura opt for the convenience of a rental car to free themselves from the restrictions of timetables. Rental cars are provided by leading companies such as Avis, Europcar and Hertz, all of which have representatives and fleets at Fuerteventura Airport. Car parking facilities include a short-term and a long-term car park, with a total of 1,700 spaces and designated spaces for disabled passengers. Boasting the best beaches and longest history of any of the Canary Islands, Fuerteventura is very popular with tourists wanting to bypass the tourist 'traps' of Gran Canaria, Lanzarote and Tenerife. The island is virtually devoid of modern man-made attractions, apart from La Lajita Zoo (Oasis Park) and the Baku Water Park, relying instead on its spectacular natural scenery and interesting historical heritage to entice visitors. 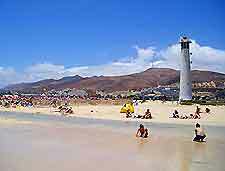 Fuerteventura holidays have been made all the more popular with the introduction of package deals many years ago and more recently, budget flights, with the peak season tending to fall between July and August - the traditional summer holiday months. Outside of this busy time, big savings are possible, particularly during the quieter winter months and early spring. Highlights close to Fuerteventura Airport (FUE) include the charming capital of Puerto del Rosario, the modern resorts of Caleta de Fuste and Corralejo, the quaint fishing village and zoo of La Lajita and activities such as windsurfing and whale watching. In total, Fuerteventura is home to more than 150 different sandy beaches, with the best being around the Jandia area and including the Costa Calma and Morro Jable.